We passed through charming Letterkenny on our first full day in Ireland, as we drove from Galway to Burt. We were tired from driving all day and so pressed on, but decided to stop and explore in a couple days when we made our way back south. You can do that when you have a loose itinerary and are doing your own driving — you can go anywhere you want, whenever you want. Ireland is full of small towns. Letterkenny seemed bigger than many of those we passed through, but we were shocked to learn that at just 20,000 residents it is actually the largest town in County Donegal. The largest. In my home state of Indiana, and indeed across the entire Midwest, a town of 20,000 is considered podunk. Nowheresville, USA. But Letterkenny had it going on, with an active Main Street full of shops, restaurants, and night clubs. It was quite busy even midmorning on the weekday we visited. We figured there had to be more to Letterkenny than Main Street, so I turned to Google Maps on my phone and to a tourism kiosk on the ground looking for attractions. Neither helped us much. The kiosk pointed to a tourism office on a map, so we walked over — and found no tourism office. I said to Margaret that we should go get a coffee and then move on. But she was having none of it. She said, “I’m just going to step into this convenience store and ask.” I thought she was a little daft to ask a clerk in a convenience store about fun things to do in Letterkenny. But then suddenly the store manager came out with her and was busy telling her of, and excitedly pointing the way to, a number of great things to see. Fortunately, I kept that thought to myself. Because that cathedral — St. Eunan’s — is astonishing. 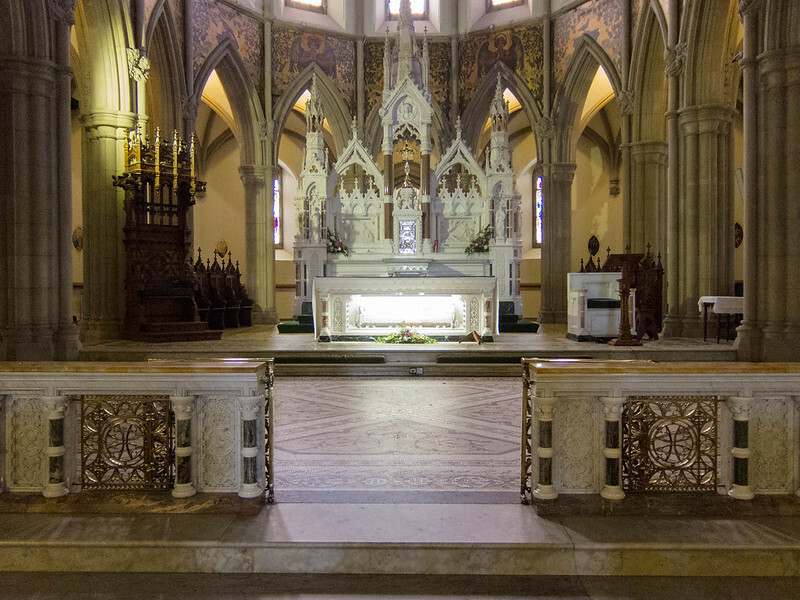 In the United States, you’d never find such a large, ornate church in a town this small. Yet here this one stood. Things can be centuries old in Ireland, so I suppose in Irish terms this cathedral is a youngster: it was completed in 1900. 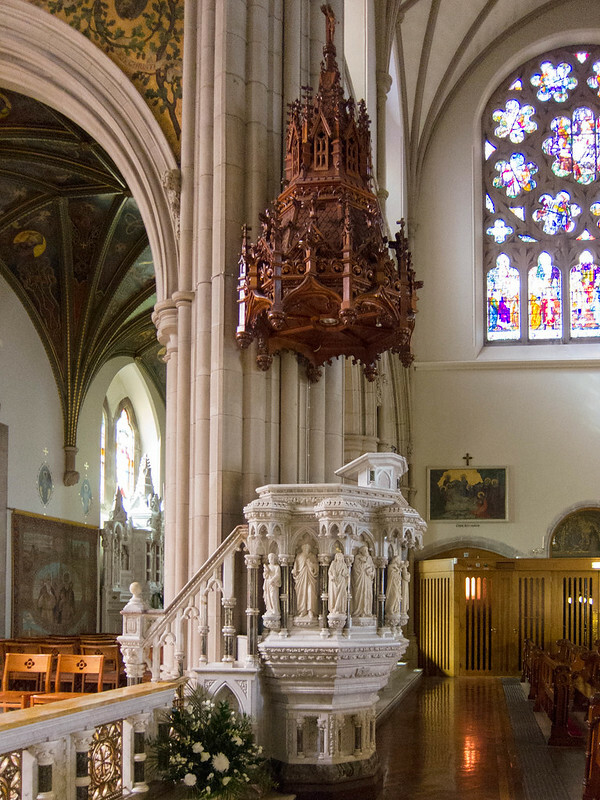 Built of Irish sandstone and furnished in oak and marble, every exquisite detail in St. Eunan’s shows great care both in construction and in maintenance. Indeed, the church was renovated and remodeled in 1985, and its exterior was cleaned and sealed in 2001. 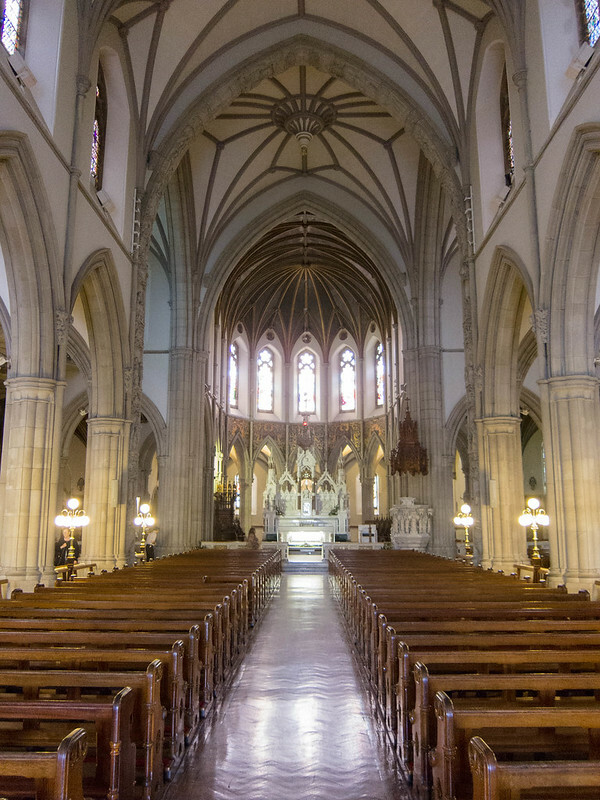 I’m not Catholic, so I haven’t spent a lot of time in Catholic churches. Except that I grew up across town from the University of Notre Dame, and my dad’s best friend was a professor there. So more than once I attended events at the majestic Basilica of the Sacred Heart on campus. Against that competition, St. Eunan’s acquitted itself reasonably well everywhere I turned. I always feel a little uncomfortable making photographs inside a sacred space to which I do not belong so I set my camera on silent mode and shot from the hip. I didn’t want to call any attention to myself. 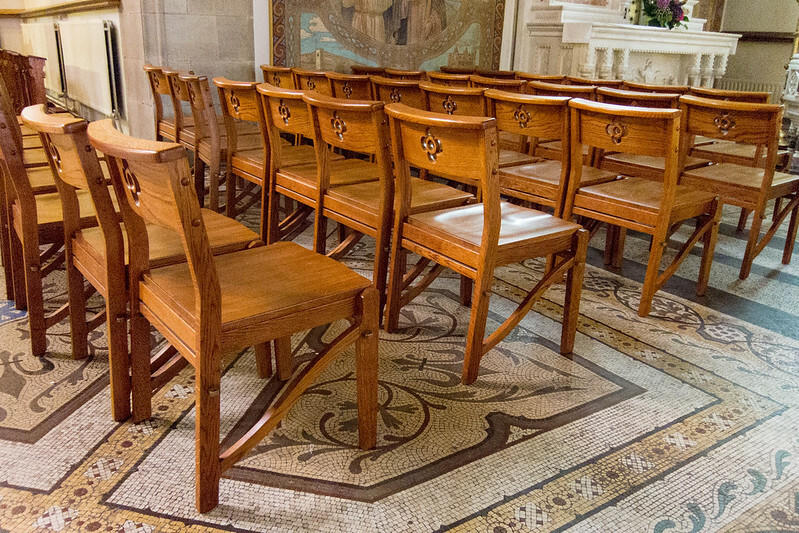 Moreover, a few people knelt in pews in prayer and devotion. I was careful to leave them out of my photographs, and to move as silently as I could to avoid disturbing them. And so these are all the photos I took inside St. Eunan’s. Each of us has a style, an approach to things. When traveling, mine is to rely on maps and guides. Margaret, on the other hand, heads out with skinty plans and then asks freely of anyone. More than once, her willingness to walk up to a person on the street, or in a pub, or even in a convenience store led us to great experiences. I suppose I don’t much enjoy talking to strangers. Ok, I’d rather saw off my arm than approach someone I don’t know. Yet more than once, my ability to interpret signs and guides and to work Google Maps led us to our destinations as swiftly and as comfortably as was possible and even helped us back out of places where we might get lost. And so as a team we had a better honeymoon than we would have left only to our own devices. And if that convenience-store manager isn’t Letterkenny’s tourism director, he should be. Yes, there are always things that a spouse can do better than I can. If not, the problem is most likely not with my spouse but with me. And yes, it is amazing to see such a beautiful church in a city of that size, particularly considering the income level of the people of that time. Over the last few generations, people have forgotten that beauty is a kind of evangelism all its own. 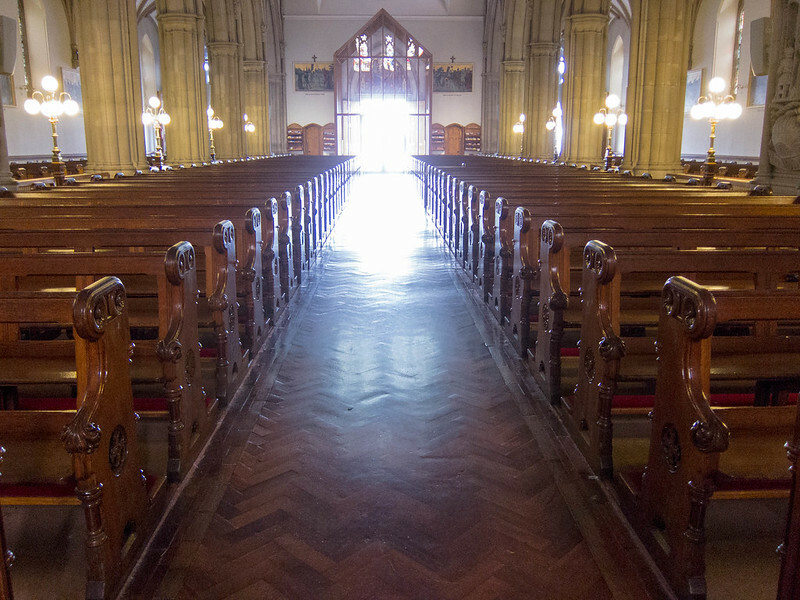 One thing that a large institutional church can do, that a band of independent churches (like the one I belong to) can’t, is pool its resources and invest. Clearly, that’s what the Catholic Church did here! It surely helps when pretty much everyone in the area belongs to the same faith, lending an almost universal “buy in” which is both financial and spiritual. I enjoyed the writing and wonderful images, thanks for sharing. Awesome, and I completely agree on the two headed travel monster. Once we were in a London train station, I’m staring at the board and my paper schedule, Tam grabs my hand and runs shouting “It’s platform three” over her shoulder. We just made the train, and it was the correct one. The system works well, although we do drive each other crazy sometimes. I hope Margaret and I always appreciate our differing strengths and know when to step back and let the other use them. 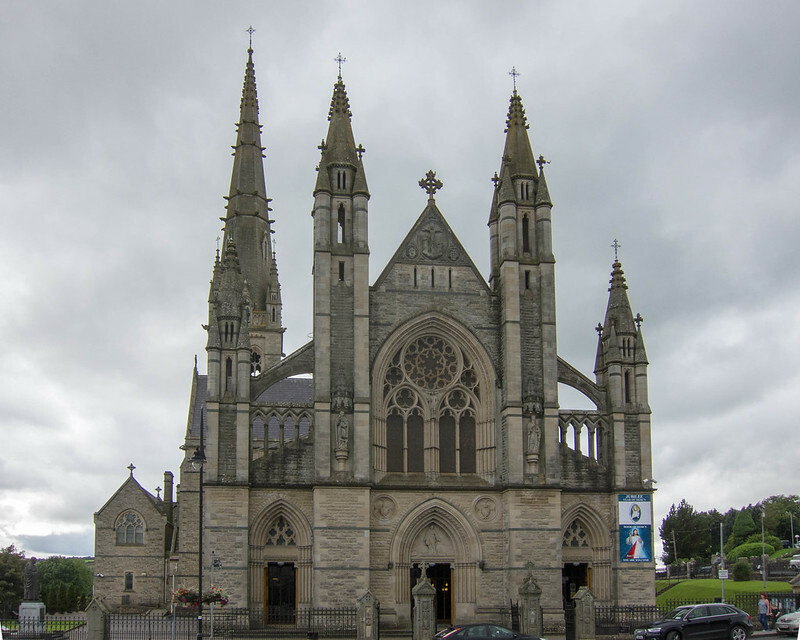 I’ve been to Letterkenny many, many times Jim (I used to do work for the Institute of Technology there) but can you believe I’ve never to the cathedral, even though it dominates the town (as with many Irish towns). You’re one up on me! It was good to finally visit there, via your photographs. It is amazing, as JP Cavanaugh says, to see a church of this stature in a town of this size, particularly so when you read this was built only a few decades after the Famine. I read that the people of the town carried the stone in buckets to the construction site. People had nothing but yet made this happen – perhaps it gave them hope and kept them going through tough times. I read that too, about the stones in the buckets. We humans are powered by hope. Perhaps building this church provided a giant dose of hope to those people at that time! So that’s the reason hardly anyone goes on their honeymoon alone. I’m with you. I do it anyway, as long as the place is nearly deserted. And I try to be inconspicuous. My S95’s screen let me shoot from the hip, which I liked.